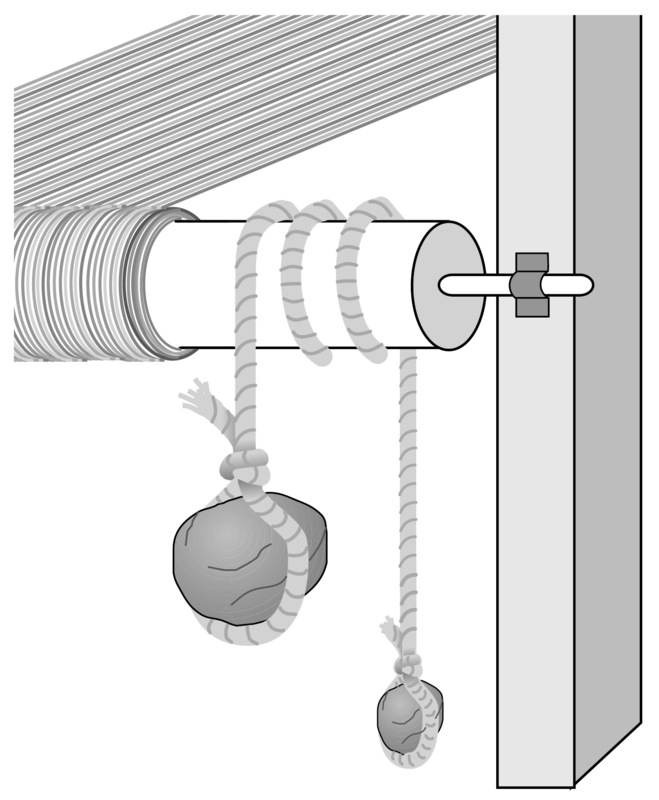 beam, hooked a rope on it, wound it around and around the beam, and hung a big rock on it. With the weight off the floor, he had full warp tension, and he was very pleased with himself. to let it down. Then he wove along until the rock got too high, stopped to unwind some rope and let it down again. This worked fine and he was very, very pleased with himself. didn’t slip. The big rock still hung in place putting full tension on the warp! He had been winding the rope say, 1/2 dozen times around the beam, so he decided to see if he could wind fewer times. He found with only 3 turns on the beam there was still not much weight needed on the end of the rope. So he hung asmall rock on the end of the rope and began weaving. As he wove along, the big rock rose and the little rock fell until it hit the floor. Then the most amazing surprise came. When the warp threads were lifted to open the shed, the beam rolled forward slightly, raising the big rock and lowering the small rock to the floor. The little rock touching the floor took the tension off that end of the rope for an instant. 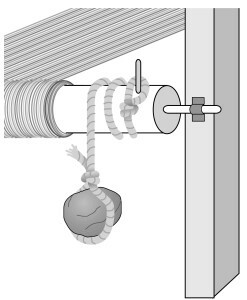 As soon as it did, the rope slipped a bit on the beam. As soon as the beam slipped, the big rock put tension back on the rope pulling the small rock up off the floor again. The slippage let the warp move forward a few thousandths of an inch—just enough to compensate for the take-up of the warp for the weft! The big rock was off the floor, obviously, while the small rock dangled just above the floor, where it bounced and dangled on and off the floor as he wove along. Now he didn’t have to get up and unwind the rope to let the big rock down! He could weave along continuously, and the big rock would hold the full warp tension. The little rock would let the warp beam slip a bit with each weft and also would let it slip when he advanced the warp. The two rocks remained in these positions all during his weaving. This pleased him very, very, very much. When the shed closed, our weaver realized that the beam rolled backwards to its starting place. The tension on the warp threads never changed even when the warp threads were lifted to open the sheds, because the weight (the big rock) was always the same. This was perfect for fine silk warp threads that couldn’t stand the stress of stretching with the old locked beam systems. He was enormously pleased with himself! 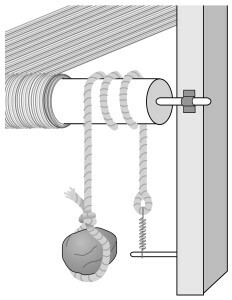 Rocks (with one rock ten times heavier than the other) and the weaver’s invention are still used today! He tried the two weights and noticed the two weights jerked when the rope slipped. Then he got the idea to use a small spring in place of the counterweight The spring let the rope slip slowly so there was no jerk or sudden change, just smooth weaving. He came up with the idea on his own, but never claims to have invented it; her said, “I always found someone else had done the things I worked out on my own.” When he needed to make smaller looms, there wasn’t enough room for the big weight so he substituted a heavy spring for the weight “It was no big advance, there was no place for the weight.” he said. It works the same way as the weight and small spring. 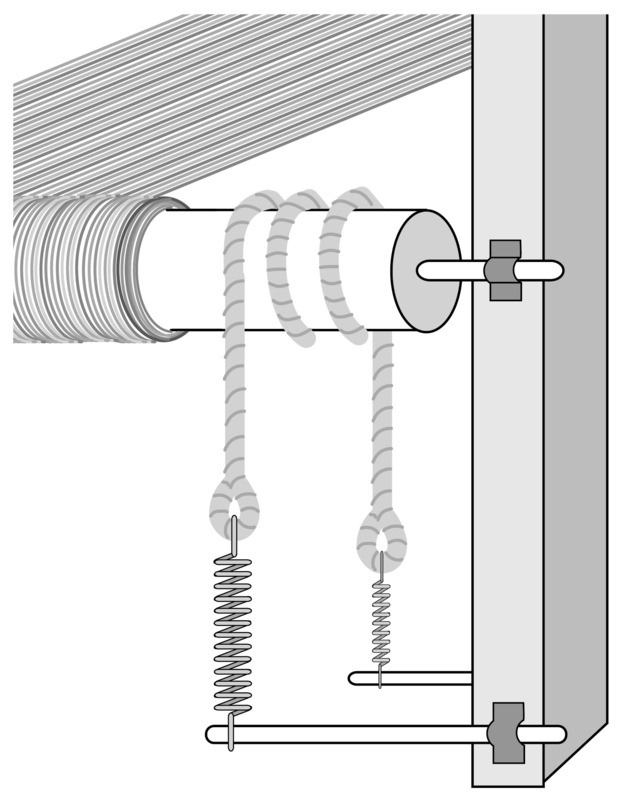 The heavy spring puts the tension on the warp; the small spring is the counterweight. 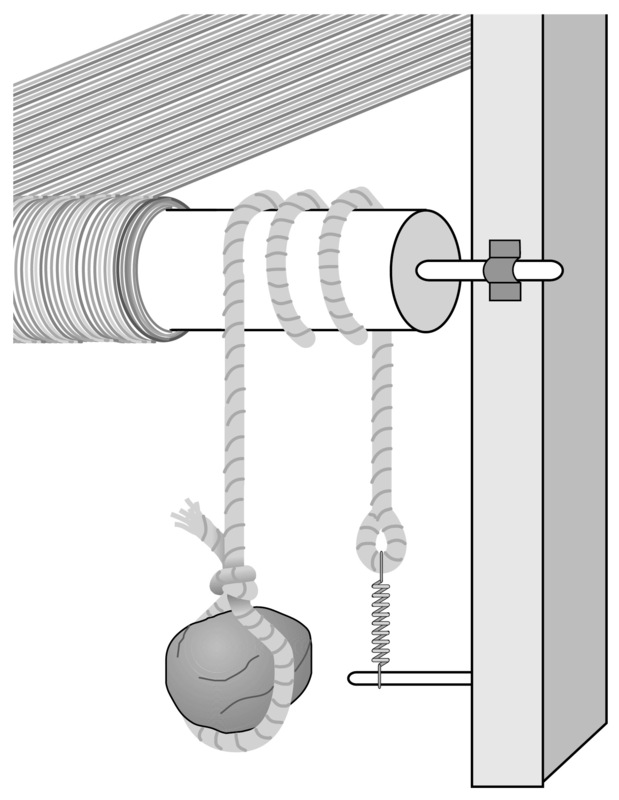 When the shed opens, the warp beam rolls forward a bit loosening the tension on the other end of the rope at the small spring. The rope slips a little. 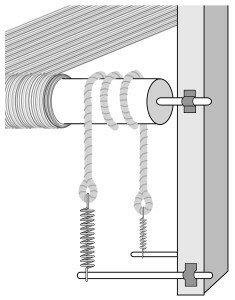 The heavy spring takes over again, putting the rope back under tension. when the shed closes the warp beam rolls back to its starting point. The slippage is a few thousandths of an inch and the warp stays under constant tension. As you crank the warp forward you exert more force on the warp than the force of the heavy spring causing the cord to slip. this allows the beam to turn and the warp to unwind. Jim preferred using the combination of a heavy weight and the small spring because he can beat harder than with just the two springs. But the double springs are a good enough substitute if you don’t beat too hard.